Will the RBI cut interest rates further? 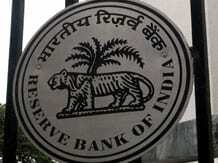 The Reserve Bank of India (RBI) is expected to go for a third cut in interest rates this year. The unanimous response to a Business Standard poll of 10 market participants was Governor Raghuram Rajan would reduce the repo rate by 25 basis points (bps) in the monetary policy review on June 2, as inflation was benign and there was a need to support growth. Since the beginning of this year, the central bank has reduced the repo rate by 50 bps (two rate cuts of 25 bps each). "Inflation is much below what RBI and most others were expecting. But the investment cycle and industrial production remain weak. There is a possibility of a rate cut. However, the transmission of policy rate cuts would depend on other factors, too. For example, banks have not been very aggressive with lending and their cost of raising money has to come down," said D K Joshi, senior director and chief economist, CRISIL. Data released earlier this month showed for April, Consumer Price Index (CPI)-based inflation eased to 4.86 per cent, the lowest in four months, owing to declining food prices. Inflation has been undershooting RBI's latest inflation trajectory and this has led to hope of a rate cut. RBI has set an inflation target of less than six per cent by January 2016 and four per cent (+/-2) by the end of the two years starting 2016-17. On April 7, at its first bi-monthly monetary policy review for this financial year, the central bank had kept the repo rate unchanged at 7.5 per cent, saying monetary transmission would determine further action on rates. The central bank had nudged banks to cut lending rates, following which lenders began monetary transmission. According to the BS poll respondents, concern over prices due to unseasonal rain has ebbed, which makes a case for further monetary easing. For April, CPI-based food inflation was 5.11 per cent, against 6.14 per cent in March and 9.21 per cent in April 2014. "It is almost as though the unseasonal rain in March didn't happen. In April, food prices fell further, both on a year-on-year and a sequential basis. There are two broad food effects at play - fruit, vegetables and edible oils buttressed the fall in prices, while pulses and the egg, meat and fish categories saw price increases," said Pranjul Bhandari, chief India economist at HSBC Securities and Capital Markets (India). In the policy review in April, Rajan had said so far this year, inflation had been on projected lines, after a sizable undershoot of the target for January. He added for the first quarter of 2015-16, CPI inflation was projected at its current levels, before moderating to about four per cent by August and firming up to 5.8 per cent by the end of the year. However, nine out of the 10 respondents believe the cash reserve ratio (CRR) will be kept unchanged, as liquidity is not a constraint. One respondent declined to comment on this issue. CRR is the proportion of total deposits a bank has to keep with RBI as cash. Currently, it stands at four per cent of a bank's net demand and time liabilities. Banks do not earn interest on CRR deposits. 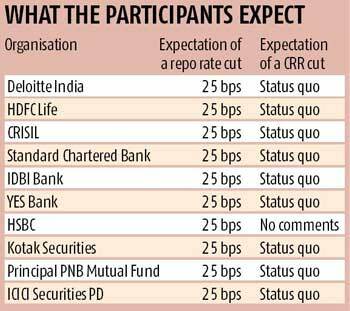 Commercial bankers said a further repo rate cut might not lead to lending rate cuts, adding reduction in the CRR alone would give banks room to cut lending rates. Bankers sought a 50-bps CRR cut, which would release Rs 40,000 crore of liquidity from banks; these funds could be deployed in interest-earning assets. Experts said a rate cut in June could be the last for this financial year. "We are not expecting a further cut in the repo rate this financial year, after the June 2 rate cut. This is because we don't expect inflation to fall much further than what we already anticipated. Based on our expectations of inflation this year, a repo rate of 7.25 per cent is appropriate," said A Prasanna, chief economist, ICICI Securities Primary Dealership.